Boyd, Frederick Cogswell (1884-1958), Coin Dealer, Business Executive, Philanthropist. He was born in September 1884, in New York City, New York, although in many legal documents from about 1911 onward, he stated in them that he was born on either April 4, or April 10, 1886. 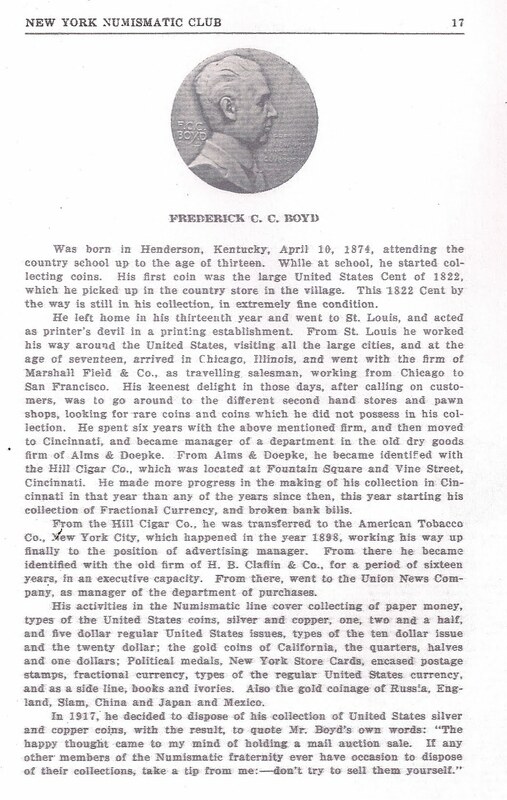 For reasons that will become apparent later on, in 1922, in The New York Numismatic Club Yearbook, Boyd claimed he was born in Henderson, Henderson County, Kentucky. Nevertheless, he was the son of a Scottish born father James Boyd (January 1839- April 1916), who came to America in 1870, and worked as a painting contractor. We have not yet discovered who his birth mother was since his father has no 1870 U.S. Census record, most probably due to the fact that he arrived in 1870, after June. It is most probable that he came to America single and met a woman in New York since their eldest child was born in New York in 1875, five years after his arrival. Moreover, no 1880 U.S. Census record for the Boyd family has yet surfaced. This record would most probably be the one that reveals the birth mother of F. C. C. Boyd, since in all probability she was the natural mother of all six Boyd children, and by 1880 the three eldest were already born. In 1951, in March issue of The Numismatist, Boyd claims his mother was Arabella Sherwood. The difficulty with this statement is the U.S. Census report of 1900, which states she has no children. Therefore, James Boyd must have been either divorced or widowed sometime after 1888, i.e., the birth of his sixth and final child, and remarried sometime before the Census report, to this English immigrant named Arabella (April 1850- July 1901), who arrived in America in 1888. The late date of her arrival into America and the early date of James Boyd’s arrival preclude her being the natural mother of any of the six Boyd children. Or else, Arabella Sherwood is Boyd’s birth mother as he claims and somehow severe errors occurred in the Census report, for one reason or another. Other curious facts are that the eldest Boyd child is named Sherwood T. Boyd, and the mother of all six Boyd children was born in England. Although these facts seem intriguing they are not compelling simply because we do not know from an original legal documentary source the maiden name of Arabella Boyd, and that his first wife, if this is the case, was also English, is too inconsequential. As we shall see Boyd has an enigmatic background and was an enigmatic person regarding his private and personal life. In 1900, the subject of our sketch was at school, living in Manhattan, New York, with his father and stepmother, three brothers (two older and one younger), and two older sisters. He was the 5th of six children in the Boyd family as the 1900 U. S. Census records giving their names and dates of their births as follows : Sherwood T. Boyd (b. May 1875), Eliza Francis Boyd (b. June 1876), Mary A. Boyd (b. August 1879), G. A. James Boyd (b. August 1881), Fred C. C. Boyd (b. September 1884), and William L. Boyd (b. December 1888). There is no mention of any children in the death notice, but that appears typical of this sort of notice at the time. Consequently, we must rely on the 1900 U. S. Census report that does state she has no children. According to the 1900 U. S. Census, his older brother Sherwood Boyd worked as a plumber. His two elder sisters Eliza Francis Boyd and Mary A. Boyd both worked as saleswomen. His older brother G. A. James Boyd worked as a clerk. F. C. C. Boyd and his younger brother William L. Boyd were both at school. It is often said that he left school at the age of 13 (i. e., 1897) to become a printer’s apprentice at St. Louis, Missouri. However, accurate as this may be (which is highly doubtful), in 1900, as we have seen he was living at 274 4th Avenue in Manhattan, New York. According to his incredulous autobiographical account given in the 1922 The New York Numismatic Club Yearbook, after his apprenticeship as a printer he traveled around the United States visiting all the large cities and at age 17 years (i.e., 1901), he worked for Marshall Field & Co., Chicago, Illinois, working as a traveling salesman between Chicago and San Francisco, California. His tall tale goes on relating how he worked for Alms & Doepke, Cincinnati, then to the Hill Cigar Co., from there he avers he was transferred to the American Tobacco Co., arriving in New York in 1898. Cementing these events together are charming, enchanting and tantalizing episodes relating how he began collecting coins and built up a valuable collection citing specific coins along the way. The veracity of his story begins when he worked for H. B. Claffin & Co, (c. 1902-1918) This is confirmed in his 1918 draft registration, which shows his employment as a buyer of dry goods for the New York City firm of H. B. Claffin & Co, one of the largest cotton textile product distributors and exporters whose incorporation dates back to the Civil War. One cannot help but notice a lack of correspondence between the historical documentary and material facts and the verbal claims and attestations made by F. C. C. Boyd, later in life when he was much older, about himself and his life as a youth and young adult, which found their way into the survey of numismatic literature. One gets the sense that he was obfuscating certain facts in an effort to conceal some deep dark secret of his youth. Upon further investigative research one discovers such an event that appears to have caused this. On July 4, 1911, F. C. C. Boyd and Ms. Mary Helen Lynch (1888-1971), [See Figure 2.] of Long Island, had a son born out of wedlock, Cogswell Charles Boyd (1911-2005). There was scandal and social stigma that accompanied young couples that bore illegitimate children, and this stigma usually prevented their climbing the social ladder crushing any hope for success of any kind in financial and career pursuits. It wasn’t until Edna Browning Kahly Gladney (1886-1961), in 1927, fought the Texas Legislature to have the word “illegitimate” stricken from the birth records of children born out of wedlock that an era flourished in the 1930’s on abating this former scandal and stigmatization. The young couple of F. C. C. Boyd and Ms. Mary Helen Lynch, apparently loved their child dearly, and neither had an abortion, nor placed him as a foundling in an orphanage, but rather, through the generous, compassionate and understanding support of family and friends placed him to live with them out of the city in an effort to erase any trail that might lead back to them. Over the years we can sense that both Boyd and his future wife, Mary Helen Lynch, will continue to change their dates of birth, Mary will eventually become known exclusively as Helen, F. C. C. Boyd will very rarely ever appear in any photograph and as we have seen will spin yarns about his early life and career, all of these behaviors in an effort to remove any connection with having bore an illegitimate son. 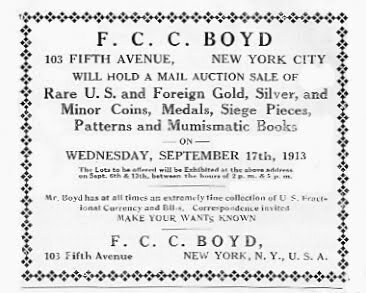 Eleven months after the birth of baby Cogswell, F. C. C. Boyd made his first appearance on the numismatic scene, in June 1912, when he applied for membership in the ANA. The following month in July he became Member No. 1594. We can only imagine and speculate how nervous and apprehensive he must have been during the month waiting period to see if anyone reported an objection bringing the news about his illegitimate son to the ANA office. Relief and joy must have been his experience when he read his name on the list of new members and was assigned a member number. At that time he was living at 439 Manhattan Avenue, New York City, New York. We can only speculate that he may have wished to join the ANA a year earlier, but was prohibited due to the pregnancy and birth of his son. If this is the case then we can only assume that he was involved in coin collecting sometime about 1910. In July 1912, he was elected to membership in the New York Numismatic Club, and exhibited an 1858 proof silver dollar. This was not an exceptionally rare coin, having more than 300 minted, but it did show not only his flair for high-grade coins from the outset but also his ability to attract attention by those who had such coins in their collections allowing him to network. His activity in the numismatic field grew rapidly and by December 1912, he was already being nominated for the Executive Committee of New York Numismatic Club. At the June 1913 meeting he was the Secretary Pro Tem. In December 1913, he was nominated as the secretary-treasurer, and he was elected as Chairman of the Executive Committee of the New York Numismatic Club for 1914-1915. On January 17, 1914, he became a Fellow and resident member of the American Numismatic Society (ANS). He contributed to the 1914 ANS Exhibition by placing on loan an 1856 $20 Blake & Co., Gold Double Eagle. In the March meeting of the New York Numismatic Club published in The Numismatist, April 1914 issue on pages 205-207, he exhibited store cards and a pattern $10, this latter piece was probably purchased from his friend and colleague in the New York Numismatic Club, Edgar Holmes Adams. During the ANS meeting held on April 17, 1914, he was placed on the Paper Money Standing Committee and Publicity Standing Committee. A brief notice for his second coin auction appeared in The Numismatist in May 1914, on 263, and repeated on p. 329. To augment the interest Boyd ran a half-page advertisement in The Numismatist [See Figure 6. ], which repeated in the June issue on page 332. 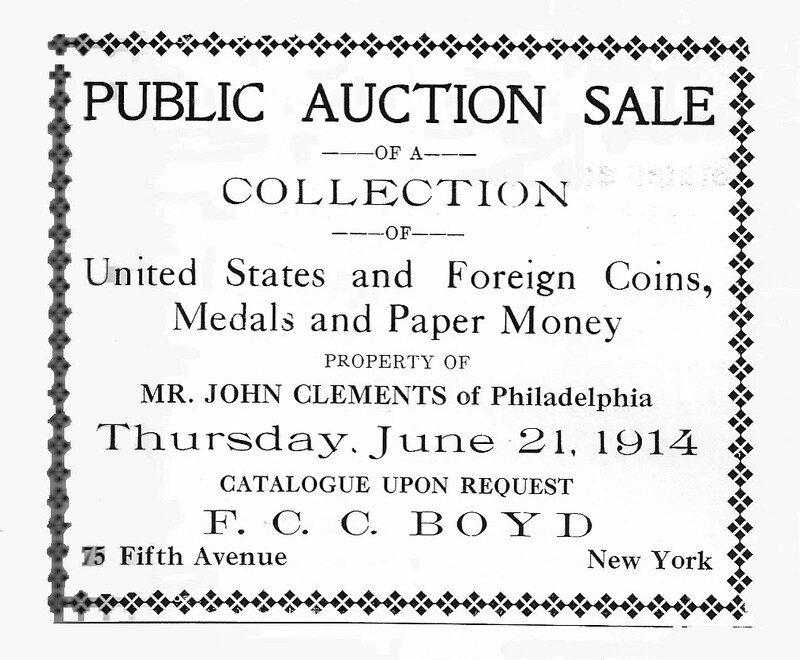 In the July 1914 issue of The Numismatist, on page 355, he expressed his gratitude for the success of the auction due to the ads. This consignor of his second coin auction is a surprise since John Clement of Philadelphia, was a long-time client of Henry Chapman. Both Boyd and Chapman were friends and colleagues in the New York Numismatic Club and so we suspect that Henry Chapman gave the client to Boyd as a referral, rather than the two dealers being rivals. At the September meeting of the New York Numismatic Club he exhibited a Spinner fractional currency note of fifty cents, and a series of various private notes printed for Bishop’s General Store, Salt Lake City, Utah, mainly dating to the late 1890’s. Boyd’s visibility and popularity as a coin dealer grew strong throughout the year and by December 1914, he became a donor ANS. Boyd was now a rising star especially within the New York Numismatic Club, and beginning at the February 1915, meeting he was placed on the New York Store Card Committee, and the Paper Money Committee, and he exhibited tokens. At the April 1915, meeting he was put on the Publication Committee; and in June, he received a silver medal for all of his contributions and work for the Club. At the August meeting he exhibited 29 medals and tokens relating to William Henry Harrison. As we have seen he was not exclusively active within the New York Numismatic Club but also was a very serious member of the ANS. In January 1915, he was on the Membership Standing Committee and United States Coins Standing Committee. Probably during the late summer or early spring of 1915, Boyd married Mary Helen Lynch. The record of their marriage has not yet been discovered. 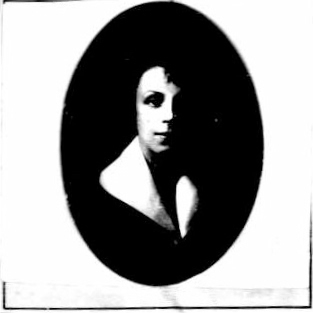 However, since her passport of May 5, 1915 states she is single and never married compounded by the fact she attended the New York Numismatic Club meeting in May 1916, addressed as Mrs. Boyd, we can only surmise that sometime after her return from England and France during the summer of 1915 and the May 1916 meeting, the two were married. Cogswell Charles Boyd was now five years old living with family and friends out of the city, but in the state of New York. It is sad and tragic that they could not live together as a nuclear family, but were compelled by social forces to live separated and apart. In 1916, he was President of the New York Numismatic Club. Her served an additional term the following year in 1917, and again in 1923. On Tuesday, April 4, 1916, James Boyd (1839-1916), the father of Frederick Charles Cogswell Boyd, died. His death notice in The New York Times was brief to the extreme, without mentioning any details of his life or family or survivors, heirs and children. Once again, we suspect F. C. C. Boyd wishing to keep himself, and any family relationships out of the newspaper for fear of discovery regarding the illegitimate birth of his son Cogwell Charles Boyd. Services were held on Thursday, April 6, 1916, at St. Bartholomew’s Chapel (Episcopal), Madison Avenue and 44th Street, New York. His father’s death was announced by the New York Numismatic Club Secretary, Moritz Wormser, at their monthly meeting held April 14, 1916. Curiously, unlike President Elliott Smith, who acknowledged the tribute of the Club on the death of his father on July 21, 1915, at the August meeting, Boyd did not follow suit during the May meeting. Perhaps it slipped his mind. Nevertheless, Mrs. Boyd began to attend meetings of the New York Numismatic Club beginning in May 1916. In any case, one continually gets the feeling that Boyd kept his private life carefully guarded. 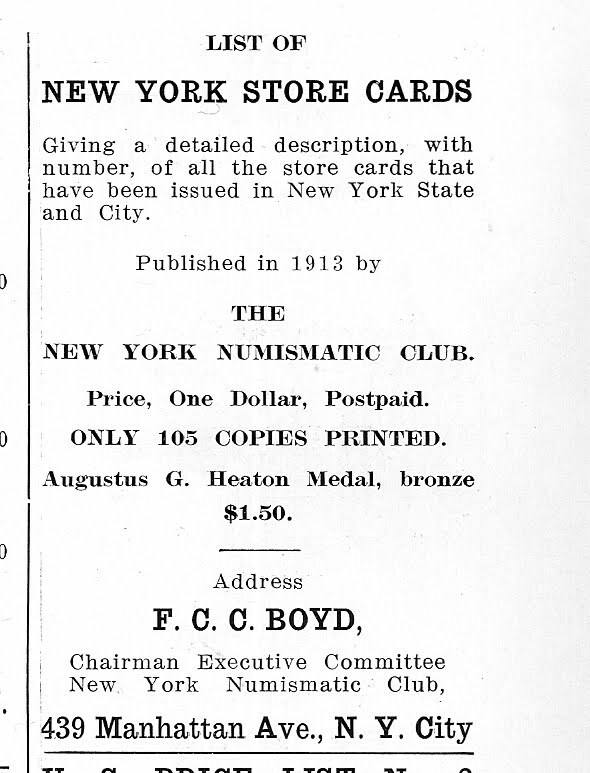 The August 1917, article in The Numismatist, “Some Early New York Transportation Tokens,” is illustrated mainly with Boyd exhibits from The New York Numismatic Club meeting in June. He served on the Council of the ANS from 1917 to 1922. 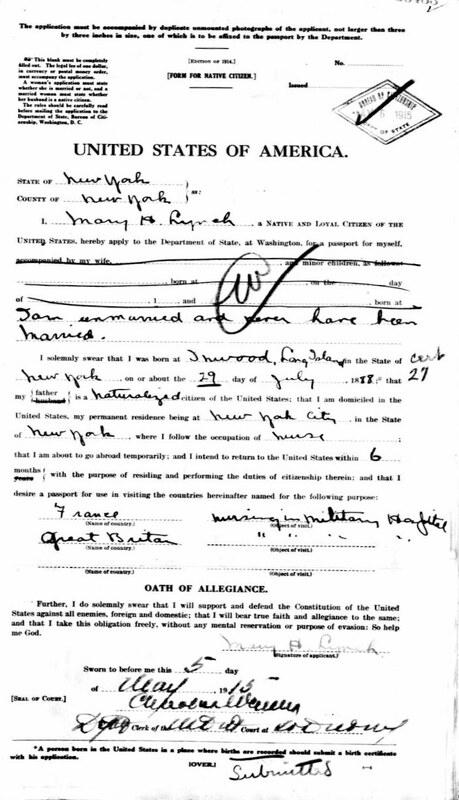 Boyd’s 1918 WWI Draft Registration Card gives his address at 584 Academy Street, New York, New York. As we have seen also states that he worked for H. B. Claffin & Company, 224 Church Street, New York, New York, as a buyer of dry goods, and that his wife’s name is Mary C. Boyd living at the same address. Although he gives her correct first name, though the last letter is scribbled over on the card, he gives her middle initial as C rather than H.
In June 1918, the New York Numismatic Club struck a gold medal commemorating the presidency of Boyd from 1916 to 1917. The medal was designed by J. M. Swanson. One was struck in gold, one in silver, and fifty in bronze. The medal is illustrated in the 1922 The New York Numismatic Yearbook on page 17, and in The Numismatist, March 1951, on page 268. He was again elected as the Chairman of the Executive Committee of the New York Numismatic Club for 1918. In 1918, he became manager of the purchasing department of the Union News Company, a subsidiary of the American News Company, and was promoted to Vice-President at the time of his retirement in 1946. In 1919, he was elected Secretary –Treasurer, of the New York Numismatic Club. In February, 1920, seven year-old Cogswell C. Boyd, son of Frederick C. C. Boyd, was a boarder living in the boardinghouse of Henry E. Treadwell and his mother, Julia C. Treadwell, at Cox Avenue, North Castle, New York. In 1920, he was elected Secretary –Treasurer, of the New York Numismatic Club. He cataloged the American Numismatic Association (ANA) convention auction in August 1922, 800 lots, with Daniel R. Kennedy as the auctioneer, at the Great Northern Hotel, 118 West 57th Street, New York, New York. In 1924 he published the book by Daniel Webster Valentine and the New York Numismatic Club, “Fractional Currency” of the United States. 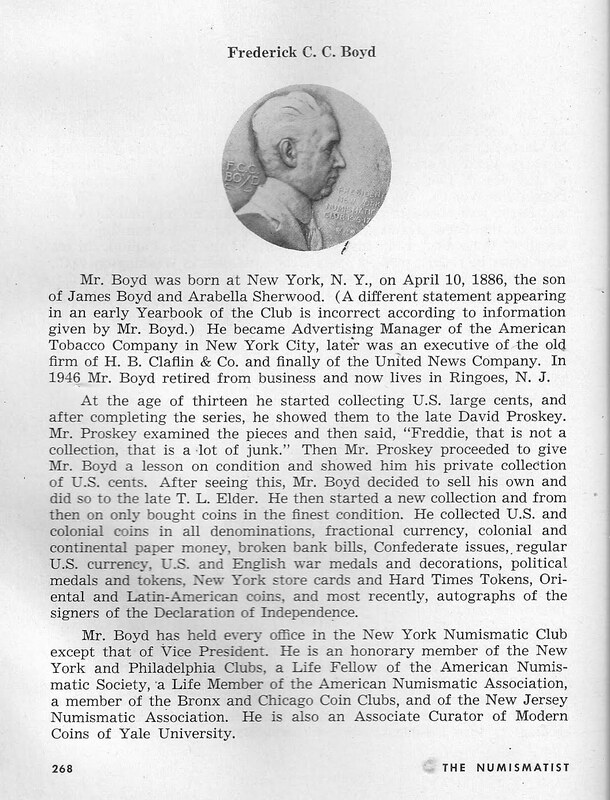 Boyd’s full-page personal advertisement appeared in the September 1926 issue of The Numismatist, on page 499, informing the numismatic public that he is still an active collector although he has recently sold his complete stock of fractional currency and some broken bank notes. Certainly, Bowers has it right when he says the advertisement was published to counter the rumor he sold everything and left the field as a collector and dealer. His address was 45 West 18th Street, New York City, New York, at the time. Sometime prior to 1928, David Uri Proskey (1853-1928), sold a hoard of bright red half cents to Boyd. He also sold him an entire hoard Indian Head Cent proofs. These were purportedly sold to Howard E. MacIntosh of Tatham Stamp & Coin Co., Springfield, Massachusetts. The 1930 US Census lists him as living at 252 East 20th Street, New York City, working as a manager of a newspaper, married to Mary, but incorrectly states her age (b. 1891), and very curiously, with a stepdaughter, Adeline Pete (b. 1903) from Arkansas. 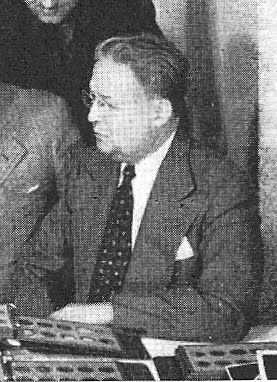 During the 1930s, Boyd served as a board member of the National Recovery Administration, and later as a board member of the Office of Price Administration during WWII. In 1933 he was the advertising and merchandizing manager of Union News buying sundry items including : cigars, cigarettes, toys, paperbacks, magazines, novelty items, snack foods and candy for their chain stores, concessions at Grand Central Station, New York City, New York, and Pennsylvania Station, Philadelphia, Pennsylvania, kiosks and newsstands scattered throughout the Tri-State area. 1935 sailed on the S.S. Majestic from Southampton, England on July 31, 1935 arriving at the Port of New York on August 8, 1935, giving falsely his date of birth as April 4, 1886. His wife Mary correctly states her birth being born July 29, 1888; they were living at 237 East 20th Street, New York City. We can only suppose she was forthright about her personal information because she was in England, not New York, and, perhaps, did not have the foresight to realize it would be a permanent public record. He is listed in the list of 1935-1936 donors to Yale University Library, and soon afterwards became the Associate curator of Modern Coins of the Yale coin collection. From 1937 to 1938 he appraised the superb coin collection of Colonel Edward Howland Robinson Green (1868-1936). On January 15, 1938 the New York Times carried the story of Boyd’s appraisal of Colonel Green’s cabinet with its amazing value (for the post depression era) of $1,240,299. In 1938 he donated a 1933 $10 Gold piece to the National Collection, Smithsonian Institute, Washington, D.C.
From January 27 to February 15, 1939 he is listed b. April 10, 1886 and his wife Mary listed under the name of Helen b. July 27, 1896, when they sailed aboard the S.S. Kungsholm on a cruise. He is reported living at 227 East 20th Street, New York City, New York. In the July 1940 issue of The Numismatist, he published an article, “Engravers of the U. S. Mint in Philadelphia,” covering from Robert Scott to Charles E. Barber. In the August 1940 issue of The Numismatist, he published an article, “William Henry Harrison : -Old Tippecanoe”. On April 22, 1943 Burdette G. Johnson sold Boyd one of the five Proof 1913 Liberty Head Nickels from the Colonel Green Estate, for $1,000.00. His address at that time was 131 Varick Street, New York, New York. Johnson also sold him the Parmelee Specimen of the Brasher Doubloon. On August 30, 1943, Cogswell C. Boyd enlisted in the U. S. Army. He was married and worked as a retail manager at the time, living in Binghamton, New York. From 1945 to 1946, Abe Kosoff and Abner Kreisberg and his Numismatic Gallery sold portions of the Boyd Collection showcasing it as “The World's Greatest Collection." In 1946 he bought an 1804 Silver Dollar from Allen. That same year he consigned the coin to Abe Kosoff, who sold it to Percy A. Smith, Portland, Oregon. In 1950 he became a Life Fellow of the ANS and a Patron. In 1956 he became a Benefactor of the ANS, and donated 13, 552 coins. In 1957 he bought a 1793 S-2 Chain Variety Large Cent. He died on September 7, 1958 following surgery at Orange Memorial Hospital, Orange, New Jersey. His residence was at 377 South Harrison Street, East Orange, New Jersey. His obituary appeared in the October 1958 issue of The Numismatist on page 1180. From November 2 to 6, 1971 Superior Galleries sold at auction the Mexican Provisional; Mint coins from the F. C. C. Boyd collection. On August 30, 1976 Swann Galleries sold posthumously numismatic literature from his estate. In 1978 he was inducted into the ANA Hall of Fame. Ironically, their website cites him as Frederick C. C. Boyd (1874-1960). On September 23, 1982, Bowers and Ruddy sold his collection of odd, curious money, and political ribbons. On 1990, Bowers & Merena, Inc., sold some coins from his collection in a mail bid and public auction sale. In 1991, Jack Collins, South Gale, California, published a Fixed Price List of Washingtonia from the collection of F. C. C. Boyd. The New York Numismatic Club Yearbook 1918-1919-1920-1921, on page 17 states he was born April 10, 1874, Henderson, Kentucky. A 1935 Passenger List for the Majestic, sailing from Southampton, England to the Port of New York, lists him born April 4, 1886, and his wife Mary H. Boyd, not only with her correct first name, but also with her correct birth date. In 1922, in The New York Numismatic Club Yearbook, Boyd claims he attended a country school in Henderson, Kentucky, until he was 13 years old. The year 1899 would be based on the April 10, 1886 date of birth. Whereas, being born in 1884 he would have been 13 years old in 1897. In this case he could have been a printer’s devil in St. Louis for a few years and returned home before June 1900. His printing background, if factually accurate, may have been the cause for his career in the newspaper industry. It has been reported in the survey of numismatic literature that Boyd began collecting coins in 1899, a date that seems unlikely. Moreover, according to his fictitious autobiographic account in the 1922 The New York Numismatic Club Yearbook, he began coin collecting about 1887. He probably took a serious interest in coins in 1909, when the new Lincoln cent was first issued making Indian Head cents obsolete. Q. David Bowers, Coin World Magazine, May 19, 2003.